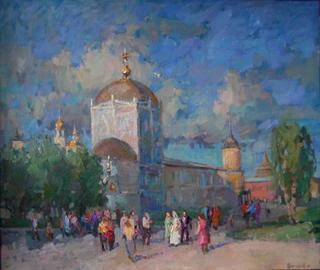 ArtistSites.org | Online Art Gallery : RUSSIAN PAINTING by oil. Landscape. Still-life. SALE of pictures from the author Zhukova Juliya. RUSSIAN PAINTING by oil. Landscape. Still-life. SALE of pictures from the author Zhukova Juliya. I regularly take part in different art exhibitions, projects and festivals. 1994 - "the Past, present, the future �" (Electrostal L.D.Kristal). 2004 - the Group exhibition: " On harovskoj to the ground "
(Harovsk the Vologda area - the central regional library). 2004 - the Christmas exhibition "Izograf" (Moscow a showroom " On Kashirke "). 2005 - the Exhibition: " About a still-life, a landscape and it is a little about a portrait " (Moscow a showroom "Avant guarde"). You do have quite a very good use of color and style - a great balance of both. the textures, they are great Juliya.